Most mainstream schools teach quantity through counting one by one. Unfortunately, this would probably be my last resort if I were to teach quantity to children with Autism. There are a few fundamental reasons for this and the best way for me to explain these reasons is firstly, to illustrate my preferred method for teaching the concept of quantity; secondly, to highlight the differences that makes it far more effective in the long run than the traditional method of teaching of concept of quantity by counting one by one. Dot cards: White cards of the same size and stick some stickers on it to represent the different quantity. Numeral cards: White cards with the numeral written on it. 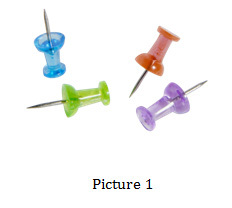 Small identical object: Example could be buttons, erasers, beans etc. * Steps illustrated are breakdown to basic steps. As every child is different, your child may or may not need to go through all the steps or may need to further breakdown the steps. introduce the concept of quantity yet. We are merely matching identical pictures. Same procedure as above but this time, the child needs to look carefully at how the “dots” on the cards are placed and match the card to the other cards where the dots are placed in a similar manner. Notice that the dot card presented to the child it of a tick and not a star. The child needs to start making sense of quantity now. He needs to begin to understand what makes the two “3s” the same. He may want to count but do not allow him to. The reason behind this is simple. Let’s do a simple test. Look at Picture 1. If I were to ask you how many thumbtacks there are, you would probably be able to tell me the answer straightaway without having to count it one by one. Our brains are able to mentally group the thumbtacks quickly, which immediately tells us the exact quantity without counting. This is what we want our kids to be able to do as well. The question arises then, on why mainstream schools continue to teach the concept of quantity via counting. The reason for this is that mainstream children are usually more mentally flexible and may have higher cognitive capacities than children with Autism. So even when they have started of learning quantity by counting, they will then be flexible and learn to group the items up mentally along the way. Though counting generally produce faster results as all the child have to go is to count the items one by one as compared to wiring the brain to group items together, but it will slow the child down in the long run. One of the traits of Autism is rigidity. A child with ASD may use the same method of counting one by one all the time even for very low quantity due to their rigidity. Now that the child has grasped the concept of quantity, we need to teach them the label for it. We always teach concept before label. The reason for this is illustrated below. If we were to teach the label of pic 4 as “chair” and if the child does not know that pic 4 to 7 are classified under the same nouns, then we need to teach the label to each and every single identical noun. However if the child is able to get the concept of what makes a “chair”, all we need is to teach the label for one of them and the child will automatically be able to accurately categorise the rest as chair as well. Now we will want the child to make functional use of the concept of quantity. Place some small identical objects (eg. buttons) in front of the child and get the child to give you a certain quantity or get him to tell you how many there are. What we are trying to do is to let the child know that the concept of quantity is not just for dots, stars or ticks on cards. It also applies to physical objects. An important thing to note is that you do not want the child to give you the buttons one by one. Think about how we pay, for instance, a cashier. We do not put the coins into the cashier’s hand one at a time. We usually count it in our own hands before giving the cashier everything at a go. So do get your child into that habit. I have not included some task breakdowns in between the stages. If your child is unable to improve to step into the next stage and you’d like to seek help, feel free to email us at info@autismstep.com.